I sometimes imagine e-learning as an amoeba. The entire outer membrane of an amoeba is expandable. At any given moment in time one or more areas of the membrane push out into pseudopods moving the amoeba forward and engulfing food for sustenance. Like an amoeba, e-learning has an expandable outer membrane. At any given moment trends push out moving e-learning forward, bumping in to barriers, acquiring sustenance in the form of knowledge on what works and what doesn’t, determining where to go next. I think of e-learning users (students, teachers, tutors, faculty, etc.) as the ectoplasm particles inside e-learning’s membrane. As a critical mass of users builds and presses outward e-learning’s membrane expands and moves, its’ future defined by all those within. The events I’ve been participating in each represent a current trend pushing out e-learning’s flexible membrane. So, here’s a bit more on these e-learning events. All of them are happening over a two month period from April 4, 2011 through June 4, 2011. The school year has a certain rhythm and these months are one of the phases in the year when professional development can happen. The number of people participating in these events ranges from 30 to over 400. The cumulative number participating in them all is well over a thousand. Events like these require extensive planning, design and production. Its a bit like putting on a theatrical production. It’s impossible for me to give a complete synopsis of each event but within each event I’ll describe some of the areas of motion and action that are pushing e-learning’s membrane and a few of the ways I’ve contributed. My colleague Tori Klassen did a fantastic job with this event and I enjoyed helping facilitate the day. Tori, wrote a great background paper on this topic which is available here. A full conference report and summary of recommendations is available here. Another related topic is the data mining of your personal interests by technology companies who then embed or present advertising to you that is customized to fit your interests. The amoeba video I use in this post is an interesting case in point. There is an embedded ad at the 10 second mark that generates an ad YouTube has determined fits your interests, Facebook does this by default too. I tried my darnedest to turn this ad off or find another clip I liked as much but to no avail. Nor is it easy to stop technology companies from tracking your interests without your approval. Reminds me of unsolicited marketing calls I get on my home phone number. Annoying and intrusive. On the other hand we’ve learned to tolerate a certain amount of this activity as we accept the fact that people have to earn a living. 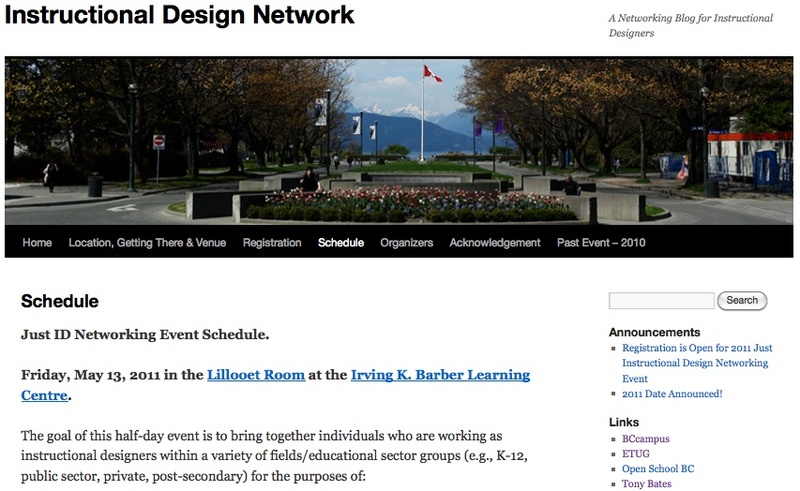 This event is organized to support discussions, networking and professional development around digital learning in BC’s K-12 education sector. The two major themes of 21st century digital literacy learning skills and personalized learning are current areas of focus. Close to one hundred sessions at this three day event explored all aspects of those themes. All sessions are listed on the conference web site. 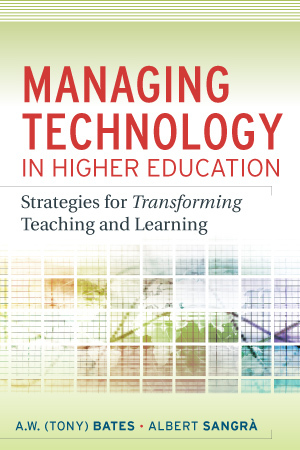 what technologies, pedagogies, and resources did you hear about that you plan to further explore? what did you learn that will help you personally in your work? The Canada Moodle Moot happens every two years and this year I served on the program planning committee. The theme for the event was “Open Learning and Open Collaboration in Canada”. I enjoyed organizing and participating in the opening keynote panel Talking About All Things Open and hearing Terry Anderson, Gavin Hendrick, and Stephen Downes elaborate on and explore some of the ideas I put forward with the University of Open. The program planning committee for the Moodle Moot event had extensive discussions around the format and topic for the closing plenary. The original topic was to compare and contrast future development plans and product road maps for different learning management systems. Canada just had a federal election. Isn’t voting in a democracy a way of crowdsourcing parliamentary representatives for the future, or at least for the next four years? What if we could crowdsource ideas on the future of eLearning at the Moodle Moot. Would those ideas be any less interesting or insightful than calling on a single keynote speaker to present their views on this topic? In any adult education scenario isn’t it true that every participant brings with them expertise, and that the cumulative pooling and sharing of that expertise creates a powerful learning environment where the sum of the whole far exceeds what the teacher could provide on their own? All ideas were then collected in a box. The night before the closing plenary I mapped all the future of eLearning ideas submitted onto a giant poster (click on poster below to open .pdf version). The ideas submitted seem to loosely fall in to categories of Global, Students, Pedagogy, Teachers, Technology and Credentials. The Global category was particularly fascinating as there really wasn’t a tick box for this category but ideas relating to eLearning’s future being global came out anyway. Some ideas could have been placed in multiple categories. Some ideas are similar and can be grouped together creating a source of critical mass. I was totally impressed with the cumulative range of ideas delegates came up with. In my view, yes, you can crowdsource the future of eLearning. Most events like this provide keynote presenters with thank you gifts. This year the Moodle Moot went with Oxfam Unwrapped gifts where the thank-you gift helps women and men in developing countries reach greater levels of self-sufficiency and control over their lives. I received two thank you gifts – Plant 50 Trees and Give a Flock. Very interesting approach. The SCoPE online community brings together individuals who share an interest in educational research and practice. 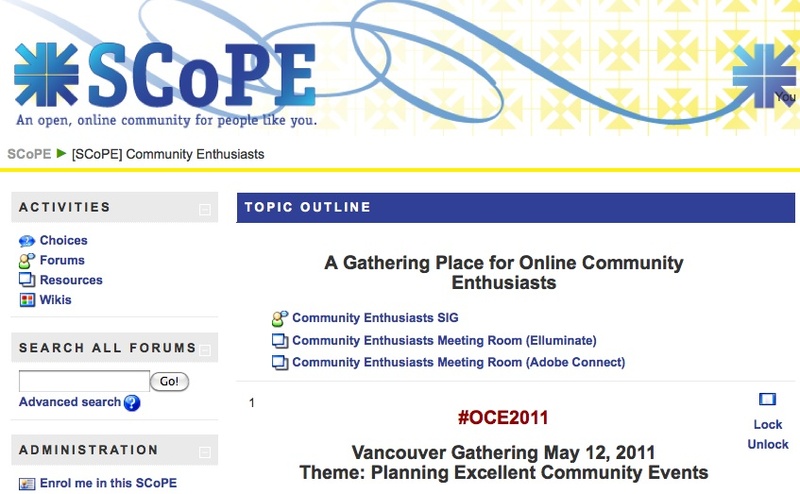 Sylvia Currie, the awesome steward of SCoPE, once a year organizes an Online Community Enthusiasts Day. This event is for all community coordinators, hosts, moderators, and everybody else interested in learning more about cultivating and sustaining online communities. It provides a gathering place to share resources, experiences, and opportunities. The theme for this years Online Community Enthusasts day was “Planning Excellent Community Events”. Since this event is all about excellent community events, a big part of the day involved experimenting with ways to enhance participation, share artefacts, and harvest what we learn. I really enjoyed meeting and working with fellow online community enthusiasts. Fantastic to see the energy and enthusiasm of all the up and coming online community leaders. It’s always interesting to hear the diverse range of uses online communities are being used for – climate action, mental health, education, religion, … A community of practice can form around almost any shared interest. Five different topics were discussed in round table discussions that rotated every 20 minutes so everyone could discuss every topic. It’s my distinct pleasure to work with BC’s Educational Technology Users Group in designing and hosting two workshop/conferences every year. Workshops are held at different BC public post secondary institution campuses every year. The Open4Learning workshop is being held beginning of June at Selkirk College in the Kootenays. 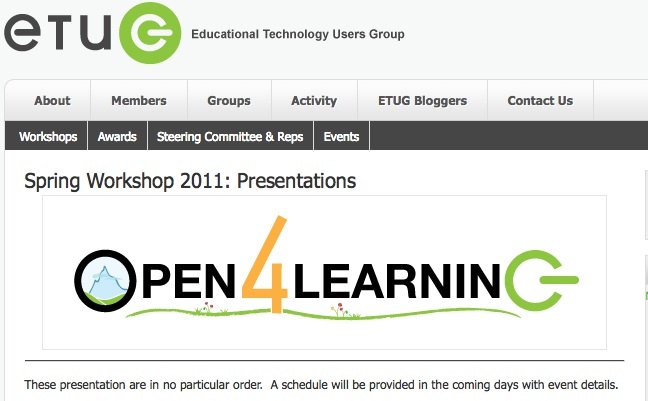 The theme for the workshop revolves around “Open”. Open and free tools, resources, and learning opportunities abound, but how are we integrating them into our work? What new skills are needed? What challenges are we facing? What value does open provide? What are the costs and risks? The event invites exploration of questions in the following 4 streams. Open Professional & Faculty Development: How do you choose which events to participate in? What formal and informal learning opportunities exist and are the best? How/have you and your colleagues given back to the educational community? MOOCs (Massive Open Online Course): Tales from the field – what’s your experience in MOOCs? Teaching & Learning in the Cloud: Has cloud computing improved the way we share and collaborate? How are you using the cloud to learn or to teach? Open/Free/Alternative Assignments: What are students doing besides traditional academic essays? Are students doing work “in the open”? What about assessment? Tool-specific: Moodle, WordPress, cloud tools…? Specific sessions on specific free/open and open source tools. What is your experience with OERs? Are you sharing? Are you using others’ stuff? What’s really going on with your OER project? Tell us more! How are we dealing with issues around privacy in a world moving increasingly towards openness, sharing and transparency? What is the impact of the recent announcements to privacy legislation for learning? What are you doing/not doing at your institution because of privacy concerns? What are the barriers of open, free, alternatives approaches to teaching and learning? Solutions/options? Is our increased use of open technologies changing our attitudes towards privacy? How? The resulting program and schedule is posted here. I’m looking forward to doing a design session around the University of Open and co-presenting the North American Network of Science Labs Online. In the spirit of openness everyone has been invited to participate in a crowd-sourced video keynote. The vision is to create a keynote video that highlights the collective voice on the value of openness. 1. What is the value of openness? 2. What examples of openness stand out to you as being valuable/worthwhile? 3. WHY do you believe in the value of open education? I put together the following short video around the first question addressing the value of open. Given these events are about educational technology and online learning they increasingly involve multi-modal delivery where some of the face-to-face activities and presentations taking place on site are webcast or web streamed over the Internet allowing those unable to travel to still actively participate and benefit. I’m a big fan of using technology like this to expand participation and have been very active in facilitating the online activities. I increasingly believe these multi-modal delivery activities need way more intentional design – it doesn’t work so well just tacked on to the existing face-to-face event as an add on. 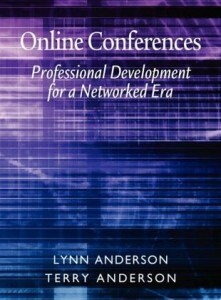 I recommend Terry and Lynn Anderson’s book “Online Conferences – Professional Development for a Networked Era” as a good overview of how this is done and the various factors that should be considered. Finally these events take a lot of people to produce. I’m tempted to name names and personally thank them all but the list would be like rolling credits at the end of a movie. So let me just say I sure enjoy working collaboratively on these events and deeply appreciate the creative effort of all involved. It’s great fun working with you all pushing e-learning’s flexible membrane forward like an amoeba. What a great summary! One thing that strikes me is the many common threads running through all of these events, and the variety of communities and groups involved. On a personal level I am connected to all of them in some way. On a community level we are crossing so many boundaries and there is a sense of constantly reflecting, building, rethinking, and moving forward. And the collaborative effort to make this all happen is extraordinary. I just bookmarked it with the OCE2011 tag to bring it into the Gathering of Online Community Enthusiasts collection. My “commitment wall” contribution was to think long and hard about best practices for harvesting event artefacts, so this is a start! Sylvia, glad you like this summary. Agree there are common threads running through these events. Thanks for being such an integral force in the wonderful variety of communities and groups involved. In the nucleus of the amoeba. My commitment wall contribution is to design a f2f/online event with the participation and interaction 50/50 between those online and those f2f. The crowdsourced chart showing the ‘future of e-learning’ is great! I spent a very enjoyable & informative half-hour browsing the predictions. Is it just me or are we really moving towards some sort of shared vision about what the future will be, or could be? Not quite agreement, but not exactly fuzzy either. And I loved the use of the amoeba as a metaphor for e-learning! My favourite amoeboid is the giant amoeba, whose scientific name is Chaos chaos. Keep in mind that the scientific definition of the word ‘chaos’ is not randomness or disorder but a dynamic system with a sensitive dependence on its initial conditions. Seems to fit e-learning very nicely! The crowdsourced chart showing the ‘future of e-learning’ is especially remarkable to me for a number of reasons. There was considerable risk around the format and structure of the activity itself and many involved in planning did not think it would work. If it failed, we’d be left without a closing plenary. MoodleMoot participants generated this list of ideas in less than 5 minutes of time preceding an early morning keynote by Martin Dougiamas who waited patiently while I exhorted the delegates to think of and jot down their ideas. Stephen Downes, who keynoted the day before, had referenced his own Future of E-Learning document written in 1998 that served to establish his creds as a thought leader in e-learning. I was intrigued by the juxtaposition of a single person’s take on the future of e-learning with a crowdsourced take 13 years later. Its interesting to read Stephen’s document http://www.downes.ca/future/ and contrast it with the ideas generated by delegates at the MoodleMoot. When I browse the Moodle Moot future of e-learning predictions I too sense that a shared vision is emerging. Exciting times ahead. Thanks for sharing with me your favourite amoeboid! Awesome! I’m definitely enjoying the information.